Wood curtain rod pole bracket with a 6 inch projection. Use with Wood Trends 1 3/8 inch Classics collection. Suggested placement is no more than 4 feet apart. Front to back: 7 5/8"
Standard wood curtain rod brackets 4 1/2 inch projection for 2 1/4 inch wooden curtain rod. These wooden curtain rod brackets have a 7 inch return. Over all size is 5 1/2 inches high by 1 inch wide by 8 inches deep. Wood curtain rod brackets for the Renaissance collection. Roma finial end cao for 2 1/4 inch wood curtain rods. Size is 7 inches long by 4 inches wide. In stock colors are ready for quick shipment from factory. Renaissance Collection by Design Elements. Wood drapery rods. Bamboo drapery rods look, solid wood construction. Kirsch's reputation for quality and elegance was built on Wood Trends. These classic styles in rich colors and subtle grains complement wood furniture finishes and architectural details, allowing for a totally original design statement. With a wide assortment of components such as elbow brackets, swivel sockets and holdbacks, Wood Trends is not only timely but also functional. Note: Some colors are more, unfinished is less than amount below. 1 1/2 inch pin on drapery hooks. A commitment to quality. Our commitment to quality is steeped in tradition. Whether it's inspiration you seek or innovation you crave, energize your creative spirit with the drapery hardware collection by Graber. 14 per envelope. Order in 12 foot increments. Use to build a cord draw, ceiling or wall mount traversing rod. For pinch pleat or ripple fold drapery systems (sometimes called coil drapery). When having track cut, choose UPS for Cut Track in the Shipping Methods at check out. Maximum cut must be less than 105 inches. Double rings for curtain rod for 1 inch pole. 1 1/2 inch inside diameter by 2 inch outside diameter. Some colors are more than base price. One way right. Superfine traverse rod includes 17 slides and 3 support brackets. Clearance 2 to 3 inches, return 3.5 to 4.5 inches. . Superfine Traverse Rods include drop in brackets, supports and cord tension pulley for installation. Made from heavy gage steel with a baked enamel finish. Exclusive Kirlon on all sliding surfaces. Push in brackets and extension plates are available as an option. Only the finest pulley sets are used. Strong and durable with a slide gate for easy removal of extra slides. Long wearing, stretch resistant polyester cord and continuous lacing for use at either end or to convert to a one way draw. One way draw, extends from 38 to 66 inches. 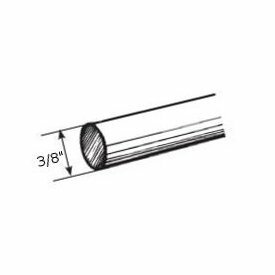 0-701-1: Traverse rods 28-48" two-way draw projects 2 3/4 to 4 1/4"
Made to measure bay window traverse rod. Bay window drapery rods by Graber. Minimum 3 feet charge. Custom Pricing Per Foot. First three feet included in base price. Fraction --select-- 0 1/8" 1/4" 3/8" 1/2" 5/8" 3/4" 7/8"
Projection --select-- Single 2 3/4" to 4 1/4" Double 2" to 3" and 5 to 6 1/2"
Clean, modern look for any room. Use with standard curtains, loop top curtains, or eyelet curtains. 3 and 6 inch projection wall mount mount double curtain rod bracket for 1 1/2 inch diameter indoor or outdoor curtain rod. Front rod 1 1/2 inch, back rod 1 inch. Available in two colors in stock, ready to ship. It can be used indoor or outdoor. Use on those windows that face patio or pool area, or use inside on any window. Charleston collection by Design Elements. Zinc plated drapery tension rods. 2 per bag. Zinc Plated. A cafe curtain rod by Kirsch. Project 2 3/4 to 4 1/4 inches inside and 6 1/4 to 8 1/2 inches outside rod. White finish. A double curtain rod combination for a traverse rod layered wide pocket topper valance treatment. Clearance 2 to 3 1/2 inches inner and 6 to 8 1/4 inches outer. Valance pocket size required 3 to 3 1/2 inches. Made of heavy .0165 gauge steel. Laced with heavy duty braided cord. Standard cord length is 7 feet on all Graber traverse rods. Drapery double rods. Graber double bracket curtain rods. This curtain rod is designed to commercial quality specifications demanded by hospitals, hotels and other commercial buildings where high traffic and abusive use is prevalent. Yet, it's sleek 3/4" x 1" profiles blends into any home decor with ease. Order in 20 foot increments. Baton draw, ceiling or wall mount. For pinch pleat or ripple fold drapery systems. White finish. For 100 percent fullness, 2 1/8" on center. Use with 94001, 94003, 94004, 94005, and 94008 Architrac curtain rods. Also works with other Kirsch curtain rods. Use with 92145-1-052 snap tape. Mojave white, 1" wide, 4.25 inches on center for 60, 80, 100 and 120 percent fullness slides. This item is sewn to the top, back of your curtain or drapery fabric and attaches to the fullness carrier of your choice. The more fullness you choose, makes for a greater stack area on the sides when the drapery is opened and the smaller the pleat (ripple) size. The less fullness you choose, the less stack and wider the pleat (ripple) size. Fits all Kirsch ripplefold carriers including the 94001 track. Up to 84" wide and 8 feet long. Sheerweave 5000 is made of polyester and vinyl coated polyerster combinations. Openness factor varies by pattern selected from 3 percent up to 10 percent. At left you can see one of many installations that makes motorization desirable. Any window in your home that is hard to access for window treatment control is a candidate for motorization. Measuring for your shades: For inside mount, give exact width of the top where you will mount the brackets and the exact height from the top to the bottom. Factory will make allowances. For outside mount, give width from where you plan to mount the brackets. On the height, give measurement from where you plan to mount the brackets to where you want the bottom of the shade to be when in fully closed position. Somfy LT30 Radio Frequency 12 volt Motor optional. Width --select-- 79" 80" 81" 82" 83" 84"
Fraction Width --select-- 0" 1/8" 1/4" 3/8" 1/2" 5/8" 3/4" 7/8"